As you know, detergents contain acid and alkali solutions to dissolve dirt. What are the difference among alkaline detergent, neutral detergent and acid detergent? Alkaline detergent has pH value above 11. Weak alkaline detergent has pH value between 8 and 11. Alkaline detergents contain components like enzymes that digest proteins, fats, or carbohydrates in dirt, molds in bathroom, glass windows, fan hatch, etc. The touch of alkaline detergent is a bit slimy, caused by melting proteins. We recommend you to use rubber gloves. Acid detergent has pH value below 3. Acid detergent can cross cell membranes and poison a specific enzyme that many bacteria and fungi need for survival. Humans don't have this enzyme, so it's harmless to them. Acid detergent is recommended for toilet and bathroom. Neutral detergent has pH value of 6 - 8. This type of detergent is recommended for kitchenware. To distinguish the difference from weak alkaline detergent, we call it neutral detergent. You can safely use neutral detergents with bare hands. Soap is generally composed of sodium or potassium salts of fatty acids derived by reacting fat with lye in a process known as saponification. Industrially, it is made from rendered beef fat and can also be made of vegetable oils. Detergents contain surfactants (surface-active agents) that increase the spreading and wetting ability of water. 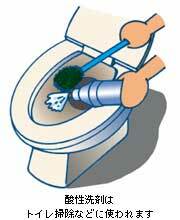 This way, it can easily dissolve oil and remove dirt. Toilet soap is used for washing face and for taking a bath. This type of soap is highly soluble to water and alkalis like sodium (caustic soda [NaOH]) and potassium (caustic potash [KOH]) are mainly used to make this soap. Sodium soaps are "hard" soaps while potassium soaps are softer. There are also some, where soap is made with both sodium and potassium. 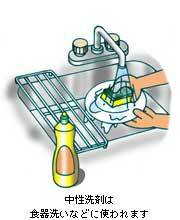 Medicinal soaps contain disinfecting and sterilizing substances, and is used in toilet and bathroom. The use of Triclosan and Triclocarban as effective antiseptics in soap and detergents is now widely used. In addition, disinfectants like amphoteric detergents are considered medicinal soap in Japan. Bar soap or powdered soap for laundry as its name implies, is a type of detergent widely used for washing laundries, or fabrics or clothes. Some laundry detergents have brighteners (fluorescent whitening agents [FWAs]) added to make the clothes appear cleaner or whiter. There are people who dislike this as it sometimes results to fading of clothes. Apart from it, many are conscious about water temperature. Many detergents contain bleaches that won't be activated on lower temperatures. Thus, we like the water temperature as high as possible. You can utilize the remaining hot water in your bathtub to cut water bills. What is the scientific technical difference between soap and shampoo? The main reason for development of shampoo is that it's milder and don't dry your hair like a soap does. Soap bonds to oils with such affinity that it removes too much if used on hair. Shampoo uses a different class of surfactants balanced to avoid removing too much oil from the hair. Shampoo also lathers much than soap and this make it easier to wash your hair using shampoo. The difference between shampoo and soap include: Easy rinsing / Good finish after washing hair / Minimal skin or eye irritation / No damage to hair / Low toxicity / Good biodegradability / Lower the surface tension of a liquid, allowing easier spreading / Proper detergency without degreasing / Ability to form delicate and rich bubbling. This article is maybe not enough to understand soap. But we are happy if you understand that all soaps are not the same, and if you can find or choose the right soap for your needs. The first patent issued in the United States was for a soapmaking ingredient. Soap has existed since 4,800 years ago. The first company to successfully mass-produce soap was William Colgate and Company (Colgate-Palmolive Company). The Palmolive soap company was named after their most popular soap, made with palm and olive oil. In 1920s and 1930s, soap manufacturers sponsored 15 minute radio dramas to help advertise their products. These programs became known as "Soap Operas".